“It’s hard to hold your hand when you’re lettin’ go,” Kim Richey sings on her latest album, Thorn in My Heart, the eighth of a solo career that began in 1995 when Kim was 39, after she’d worked as a school teacher and tried her hand at songwriting for other artists. Her songs, on the border between country and rock, tell compelling stories about people who may have broken their heart a time or two but aren’t yet done with love. She “entices you with sad and unembellished music that reveals an original spirit,” says Billboard Magazine. “Her characters,” says the website allmusic.com, “are honest, vulnerable, wary, and confused; their disappointment never bitter; their optimism never totally vanquished when things don’t turn out properly.” The songs get under your skin and into your head – and you want to hear them again and again. 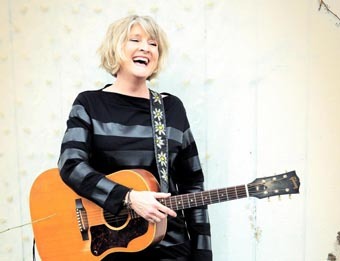 Kim, who grew up in Zanesville, Ohio, has written or co-written songs recorded by Trisha Yearwood, the Dixie Chicks, Mindy McCready, Maura O’Connell, Brooks & Dunn, and the Greencards. She’s sung on albums by Ryan Adams, Shawn Colvin, and Mary Chapin Carpenter, and received two Grammy nominations. Her 1999 album Glimmer won Alt-Country Album of the Year honors in People Magazine. The new album is even better. Here’s another line from one of the songs: “Love is an accident waiting to happen if you don’t watch your step.” Be careful when you listen to Kim. If you don’t watch your step, you just might fall in love with her heartbreaking music.